A pioneer in war photography and the photography of Japan, Felice Beato is believed to have been born between 1825 and 1830 on the Greek Island of Corfu, then a British protectorate. Although little certain can be said about his formal training or early career, Beato is known to have begun work as a photographer as early as 1851, when he traveled to Constantinople with his brother Antonio to work for James Robertson, an experienced photographer who would later become their brother-in-law. By 1853, the Beatos and Robertson had formed a partnership, taking touristic images of famous sites throughout the eastern Mediterranean and Palestine. In 1855, Robertson and Beato shifted course and lit out to document the Crimean War battlefields at Balaklava, following immediately on the heels of the photographer Roger Fenton. Three years later, Beato ventured even further afield, heading to Calcutta and northern India to take photographs of the devastation following the Lucknow Revolt, and producing a series of graphic images that are sometimes considered to include the earliest depictions of war dead. After spending an undetermined period of time in England, Beato left for Japan prior to 1863, and although he was not the first photographer there, his images are among the best known of the late Edo period. Once settled in Yokohama, he opened a photographic and art studio with the English journalist and illustrator Charles Wirgman, producing a stunning array of views, portraits, ethnographic images, and genre scenes over almost a decade and a half. 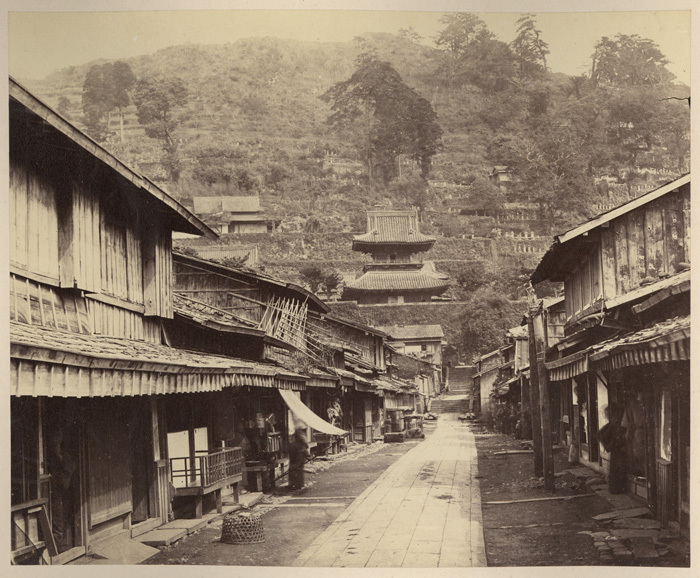 He traveled throughout Honshu and other Japanese islands, becoming the official photographer on the military expedition to Shimonoseki in September 1864, and producing a widely reproduced series of views of Nagasaki and its surroundings shortly thereafter. After a fire destroyed all of his negatives in 1866, Beato resumed work with great energy. In 1871, he accompanied a United States naval expedition to Korea, sometimes referred to as the first Korean War, again as official photographer. Just as important as his documentary work, however, Beato is reputed to have helped train the first generation of Japanese photographers, including Kusakabe Kimbei, as well as the noted German photograph Raimund von Stillfried. Beato remained in Yokohama until 1877 at which time he sold his negatives and studio to Stillfried’s firm. Later in life, Beato photographed in Africa and southeast Asia, but he appears to have stopped photographing after 1899. He died in 1908. Felice Beato Photograph Collection (PH 4). Special Collections and University Archives, W.E.B. Du Bois Library, University of Massachusetts Amherst. This collection was originally found housed with the John Thomson Photograph Collection (PH 2) and the Walter Bentley Woodbury Photograph Collection (PH 3), which seems to indicate that the images were acquired together. Collection was processed and images scanned by Meghan Fahey, August 2007.
image 27 x 20.5 cm., on mount 45.5 x 35 cm. image 28.5 x 19.5, on mount 45.5 x 35 cm. image 27 x 21 cm., on mount 45.5 x 35 cm. image 30 x 23, on mount 45.5 x 35 cm. 28 x 23 cm., on mount 45.5 x 35 cm. 29 x 21.5 cm., on mount 45.5 x 35 cm. 22 x 28 cm., on mount 35 x 45.5 cm. 21.5 x 18.5 cm., on mount 28 x 23.5 cm. 29.5 x 21 cm., on mount 45.5 x 35 cm.